This blog post is the third and final post in a series of three highlighting John Melish, a 19th century cartographer, and the impact his 1816 map, Map of the United States with the Contiguous British & Spanish Possessions, had on U.S. history. As the United States acquired significant territory through the 1840s and 1850s, borders between newly admitted states followed boundaries established in the Adams-Onís Treaty of 1819. Border disputes between states emerged as a result of several inaccuracies in Melish’s map. One particular hotbed of contention was the Red River area. According to the Adams-Onís Treaty, the boundary between the Spanish colony of Mexico and the United States began at the mouth of the Sabine River, went north to the 32nd degree latitude line where it intersected with the Red River, and then followed that river west until it reached the 100th Meridian. However, there were several problems with Melish’s depiction of the area. Firstly, his 100th Meridian was off target by nearly 90 miles. Secondly, Melish only recorded a single fork in the Red River while, in actuality, there were two. These errors became problematic in deciphering the border between Texas and the Indian Territory (Oklahoma). “Saga of the Lost County: Court Ruled and Overnight Texans Became Okies,” Frank X. Tolbert, Dallas Morning News, June 20, 1960. Greer County (Texas and Oklahoma) Clippings Vertical File, The Texas Collection, Baylor University. The fact that Texas entered the Union under unique circumstances also complicated the dispute. According to agreements made with the U.S. government prior to annexation, Texas was granted the right to settle boundary disputes. Texans argued that the north fork of the Red River was the actual boundary, primarily because the southern fork resulted in significantly less land for Texans. 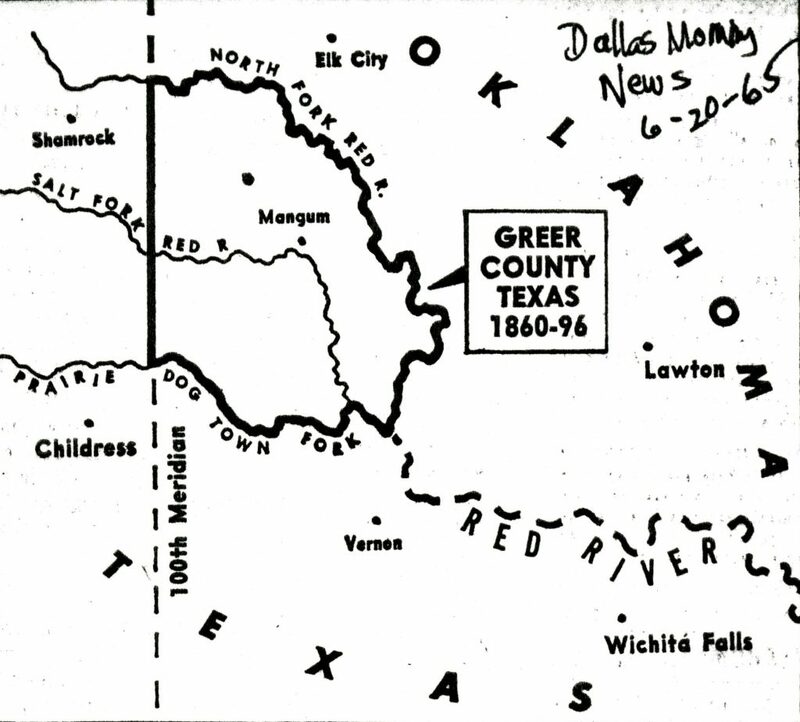 As members of a joint commission between the United States and Texas sought to negotiate a compromise, the Texas government established Greer County in the disputed area in 1860. With the outbreak of the Civil War in 1861, any further resolution to the matter was delayed. By the 1880s, Texas began distributing the land to settlers. Another joint commission was authorized in 1885, yet once again, both sides failed to reach an agreement. When the Oklahoma Territory was organized in 1890, a suit was filed in the U.S. Supreme Court requesting that the disputed area be given to the U.S. government. On March 16, 1896, the Court ruled that the south fork of the Red River was the primary branch depicted on Melish’s map and was therefore the official boundary. The disputed land became property of the federal government. This, however, was not the end of the dispute. The exact boundary was never specified and tensions renewed when oil was discovered in the Red River region in 1918. Texas and Oklahoma filed suits to exert their respective claims over the riverbed. Texas argued that the boundary fell directly in the middle of the river, whereas Oklahoma contended that it was actually the south bank. Once again, the Adams-Onís Treaty and its original intent were reexamined. In 1921, the U.S. Supreme Court found that Texas had no claim to any part of the riverbed and that the legal border between the states was the Red River’s southern bank. After decades of contention and a clear ruling from the U.S. Supreme Court, one might think that all border disputes concerning Melish’s map had finally been resolved. Ironically, another lawsuit followed. The United States entered the fray by contesting Oklahoma’s claims on behalf of the U.S. government and members of various Native American tribes. The focus of this new round of litigation was technical in nature. What was the official definition of a riverbank? Was it characterized by the low-water mark or the high-water mark? Yet again, the original intent of the Adams-Onís Treaty was called into question. Ultimately, the Court decided that the riverbank was defined by the high-water mark and the lower portion of the riverbed belonged to the federal government. In 1927, the Court approved a final survey of the Red River boundary and the 100th Meridian, thus ending a long and contentious boundary dispute. Moore, Webb L. “Greer County.” Handbook of Texas. June 15, 2010. Accessed April 05, 2018. https://tshaonline.org/handbook/online/articles/hcg81. Tyson, Carl N. The Red River in Southwestern History. Norman: University of Oklahoma Press, 1981.